This comedy plunges us into the world of sewing machines, oversized foam swords, flowing robes and lots of makeup: the local cosplay scene. Royston (Pang) is a shy, top-scoring student with social anxiety. His mother Mei Feng (Quan) intends for him to become a doctor, but Royston dreams of being a fashion designer with his own label in Japan. Royston tailors costumes for the local cosplay community. His friend and client Chen Jun (Xu), who cross-dresses as female characters, eventually convinces Royston to try cosplaying himself. Royston secretly nurses a crush on his classmate Violet (Chu), a conceited social media darling from an affluent family. Royston’s best friend Hao Ren (Tan), an enterprising smooth-talker, encourages Royston’s pursuit of his hobby. Royston, Violet and Hao Ren eventually form a cosplaying team, while facing opposition from all sides. Mr. Boo (Singh), the school’s stern Discipline Master, is none too pleased that his students are diverting their attention away from their studies. Will passion conquer all, or will reality stomp on their dreams? It’s perfectly understandable that actual cosplayers would be wary of Young & Fabulous. After all, the hobby has often been misunderstood and thus misrepresented by those on the outside. As with any circle of enthusiasts, there are figures in the local cosplay who are admired for their craftsmanship and others who have gained notoriety for some reason or another, with a surprising amount of politicking in between. Anyway, it’s most helpful to think of Young & Fabulous not as a movie about cosplay, but as a comedy-drama which uses the hobby as a textural element. The themes in the film are not explored with great depth, but they are readily relatable. Most any Singaporean with artistic inclinations knows what it’s like to be reminded by their parents that one won’t be able to make a stable income outside of being a doctor/lawyer/accountant. 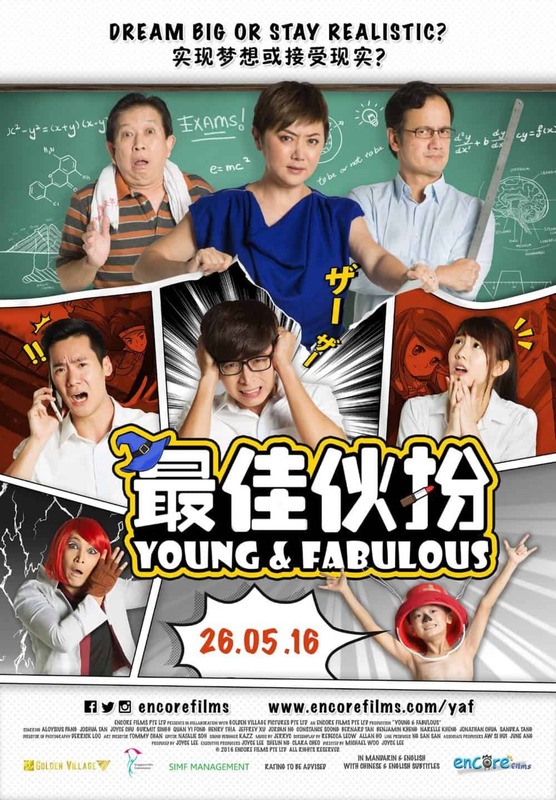 As with many commercial Singaporean films, Young & Fabulous is sorely lacking in subtlety. The stylistic flourishes that include daydream sequences filled with deliberately cheesy visual effects, or comedy sound effects and on-screen graphics reminiscent of those one would see in an anime, tend to be a little too silly. However, barring one extremely jarring tonal shift, the balance between the comedy and drama tends to work. This reviewer was moved by several scenes, and there’s also a reveal in the final act that’s a real gut-punch. While it’s far from a nuanced portrayal of the cosplay scene, a great many actual cosplayers were involved in the making of the film, and if you’re in that community, you’ll recognise at least a couple of familiar faces in the crowd scenes. In addition to the standard blooper reel, the end credits also feature short interviews with actual cosplayers, including a pilot, a lawyer and an engineer, who explain what drew them to the hobby. Pang, one of local Chinese-language television’s “Eight Dukes”, is eminently endearing and easy to root for as the shy, stuttering underdog who eventually comes into his own. There are several moments when he dials the awkwardness up to 11 and it feels like an affectation, but that can be probably chalked up to a directorial choice as well. Nevertheless, there’s a depth of sincerity to his performance here. When Royston breaks down in tears, it is genuinely heart-rending. Ah Boys to Men star Tan is immensely likeable, charming when the character could’ve been plenty obnoxious. Hao Ren is an experienced huckster who’s opportunistic, but never at the expense of looking out for his friends, and seems like a pretty awesome wingman to have around. Malaysian singer Chu makes her acting debut in this film. Unfortunately, she has to bury her innate sweetness beneath layers of a princess complex. As far as female leads go, Violet is surprisingly catty and unkind, which brings us to the conclusion that Royston is really only drawn to her looks. There is an attempt to justify Violet’s behaviour by way of her snooty parents, played by Constance Song and Bernard Tan, but there’s far from enough character development if we’re expected to view Violet as a decent human being by the end of the movie. Singh makes a departure from his typically over-the-top comedic roles as the no-nonsense Mr. Boo, who seems the be the only teacher in the school. He gets to shine in a scene opposite Henry Thia, who plays Hao Ren’s father Hao Lian (a homonym for the Mandarin term for ‘boastful’), with Hao Ren translating for the two. Quan’s character, with her heart set on crushing her children’s dreams and who is prone to labelling her younger son Jordan (Jordan Ng) as “dumb”, is easy to dislike. However, it turns out that the film offers very compelling reasons for her actions and attitude, and while it’s exploration of parent-child tendencies may be very on-the-nose, it’s a relationship that this reviewer did get invested in. Quan also has a gem of a comedic scene in which she gives a speech to a sausage. We will not provide the context for this lest we ruin the joke. Xu, fellow ‘Duke’ to Pang, steals the show as the flamboyant Chen Jun, the de facto gay best friend whose sexual orientation is strongly hinted at but never referred to directly. Xu is having a ball of a time, and quite hearteningly, the film does not mock the character’s crossdressing outright. Sure, more than a few laughs are had at his expense, but he’s also made out to be confident and talented at his chosen hobby. Also look out for the members of indie band The Sam Willows, who cameo as school bullies. Young & Fabulous is surprisingly bereft of conspicuous product placement, a pitfall that affects many Singaporean films. There is a bottle of chicken essence with its label actually obscured. Co-directors Lee and Woo may not have portrayed the cosplay scene with utmost accuracy, but their intentions to depict the passion and craftsmanship that goes into the hobby cannot be faulted. Similarly, the difficulties faced by any young Singaporean in realising their artistic endeavours do make for adequately dramatic material. Summary: Dressed to the sixes and sevens, rather than to the nines – what it lacks in subtlety, it somewhat makes up for in humour and heart.